Road rage is listed among the top causes of car wrecks throughout the U.S. today. From suddenly stopping on one’s brakes to ward off tailgaters or tailgating someone who isn’t driving at the maximum speed limit to speeding to aggressively pass another driver, numerous acts on the road committed out of aggression can be categorized as road rage. It is important to note the ways in which road rage can be prevented, for the safety of everyone on the road, both in situations where one is the receiver of aggressive attention as well as if one becomes angered by the actions of others. 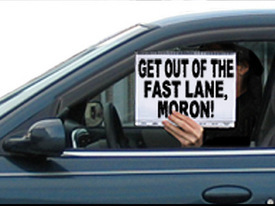 The following are five tips for helping to prevent road rage accidents. -Use turn signals – Using turn signals as required by law helps prevent confusion about whether a vehicle is turning or changing lanes, which can lead to an accident, especially on congested Dallas roads. -Change lanes with caution – Carelessly moving into another lane, without signaling can not only cause an accident, but can also anger other drivers who feel their lives have been placed at risk. -Drive in the slower lane if someone wants to pass – If a driver is driving slower than the speed limit, then the appropriate thing to do if someone is trying to pass is to move into the slow lane and allow them to in order to avoid a risky incident. -Don’t be confrontational – Engaging in confrontational behavior on the road can yield disastrous results. Keeping one’s cool at all times is important. -Call for help if serious danger arises – Calling the police, or if possible, driving to an area that is heavily populated may be necessary for those who feel that they may be in serious jeopardy if another driver’s behavior seems threatening. The Dallas injury lawyers of 1-800-Car-Wreck are available to help car accident victims who have questions about their legal options in the event that they have been involved in an accident linked to road rage. Individuals may contact the law firm of Eberstein & Witherite today for a free evaluation of their case.